Come to Lofty's, the cosiest restaurant bar on the planet, for the finest in Martian food and drink. 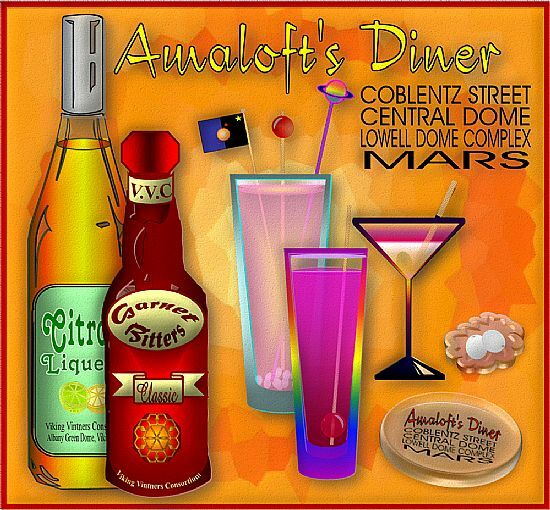 Your Host is Lofty Amaloft and you can find us on Coblentz Street, Lowell Central Dome. We stock a range of the most popular ales, cocktails and mixers including Albany Green Ale, Sandston e Tower Liqueur, Garnet Bitters, the ever-popular Loganades, Limewater Fizz and many more. Why not try Lofty's own Martian Minewater, brewed on the premises to a high standard? We also stock the best in wines including red, rosé, green, white and orange vintages as well as the New Orange all the way from Albany Green Dome, Viking One. You can also treat yourself to Lofty's own Snowpebble Cocktail, carefully mixed to tantalise your tastebuds and served up in the best crys-glassware. Or try our Fortified Caff to chase away the cold and add the perfect finish to a busy sol! Chef's Specials always include Cream-Sauce Steakfry with Fresh Chippers and Greens, and Pastellini with Cheese, freshly prepared for you while you wait. These and other mouthwatering dishes are available every sol from early until late. For your entertainment we provide a range of the most up-to-date holo-vid generators, all fitted with noise-suppression and privacy options, with games, music, information and amusements to suit all tastes. For the convenience of Customers, a delivery service is also available. For that Special Party, why not order at Lofty's? We are here to serve.